Bloch's "Chord" t-strap with 3" heel features a shank and last designed to maximize arch support. Other characteristics include a leather upper and matching heel cover, stronger heel counter and padded insoles. I bought these shoes for a show I was in and within one week, the buckle had broken and the bottom of both shoes started to peel off from the heel. The shoes are comfortable, but for the price, should not be falling apart like they are. I am hoping this was just a bad batch and this is not normal, but I will probably not be buying these again. The Shoes are 2.5" inches NOT 3. They are flimsy and came looking as if they were already broken in. They are tight in the front and wide on the sides and I feel as if any time I dance on them they are going to break. They feel cheap as if they were made out of paper and cardboard and ONCE AGAIN THEY ARE NOT THREE INCH HEELS. Also, the straps are already tearing apart. 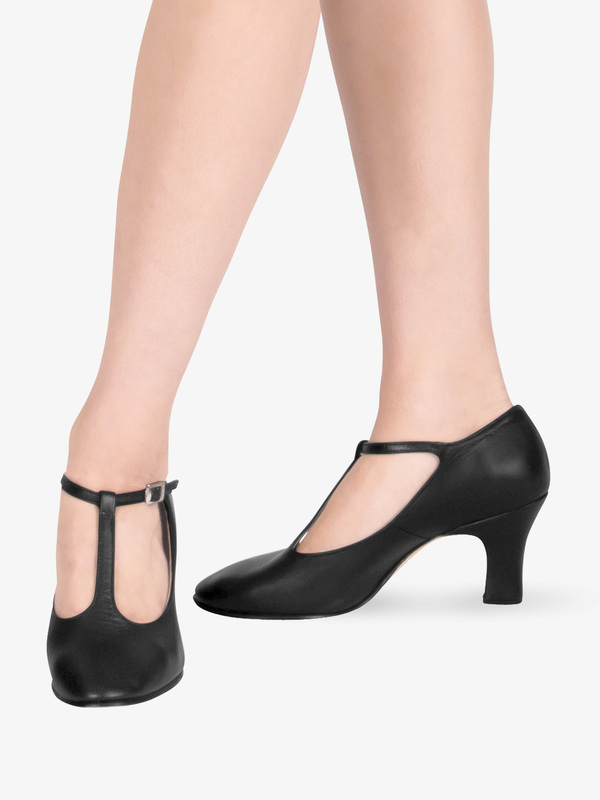 Using for a high school musical and the slightly higher heel makes a dancer's legs look great. Leather is really soft and comfortable right out of the box. I did order a full size up to get the right fit. I wear a 7.5 to 8 in street size and the 8.5 shoe is perfect. Just got them so no sure how durable they will be but picture displayed on-line shows a pin in hole buckle and that is not the case. It's a slide pressure buckle that is not as physically secure. Hoping I don't have an issue. These shoes are incredibly disappointing! The 1st pair started to break down after 4 hours of wear! The leather sole wraps up under the arch of the shoe and finishes on the underside of the heel. At the bottom edge of the heel, it began to come un-glued and detach from the heel, exposing the interior of the heel structure. So, I bought a second pair as I am in a show and couldn't be without shoes. The second pair arrived, and they are doing the same thing! 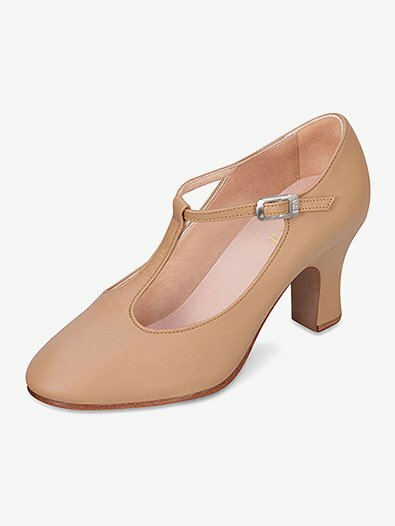 I bought these because the theatre had the same style of Bloch shoes for me to borrow, but in the wrong size. They appeared to be older but in great shape, which is why I thought it would be smart to buy my own pair. Not so. I'm guessing manufacturing and materials have radically changed over the years. Since both pairs are faulty, my conclusion is the brand quality overall is now low. This shoe runs VERY wide. I have a "normal" width foot, and these shoes swallowed me whole. I felt unstable and would never be able to dance in them. I am disappointed and will be returning the shoes. I ordered them a half size larger on account of my wider foot. They fit rather well and quite comfortably. If you don't have a wide foot like myself, you can probably order your regular street size. I am quite satisfied with these. The shoes arrived on time and were more than I expected in terms of quality. These shoes are sized a little smaller than normal. My granddaughter ordered a half size bigger than normal and they were almost too short. I am looking for the older style strap that does not have holes for the buckle - it just tightens as you thread it through. Do you have any tan 7.5 in that style? I'm sorry this is the only style of this shoe available currently. Can you add taps to this shoe? You could fit this shoe with taps but you would have to fit them with the fitting guide and have a cobbler attach them. Are the soles of this shoe leather? Are they suede? This item would have leather soles.